Mallikarjun Kharge’s Gulbarga fared the worst on malnutrition indicators among 18 high-profile constituencies, Shashi Tharoor’s Thiruvananthapuram the best. The study shows that 72 of the 543 parliamentary constituencies fall in the top two quintiles, that is 20%, according to the prevalence of child malnutrition indicators – stunting, low weight for age, wasting and anaemia. Of these, 12 constituencies are in Jharkhand, 19 in Madhya Pradesh, 10 in Karnataka, eight in Uttar Pradesh and six in Rajasthan. Many parliamentary constituencies experience multiple forms of malnutrition, which should be addressed “on priority”, notes the study, published in the journal Economic and Political Weekly in January. Currently, since boundaries of Lok Sabha constituencies and districts do not overlap, the performance of constituencies cannot be measured because malnutrition data is measured by district. Malnutrition retards learning, employability and economic growth. Yet, in a nation with 46.6 million stunted children – about a third of the world’s burden, which will make India lose up to $46 billion by 2030 – malnutrition has almost never been an electoral issue. 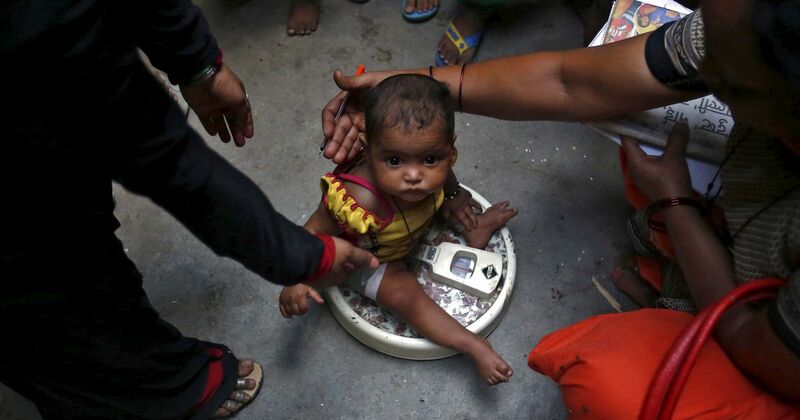 The national averages for stunted (low height for age), underweight (low weight for age), wasted (low weight for height) and anaemic (low haemoglobin) children in India are 35.9%, 33.5%, 20.7% and 56.8%, respectively, meaning almost a third of the children under five are stunted and underweight, a fifth are wasted and over half are anaemic. Across parliamentary constituencies, the proportion of stunted children under five ranged from 15% to 63.6%; of underweight children from 11.1% to 60.9%; of wasted children from 5.9% to 39.6%; and of anaemic children from 17.8% to 83.6%. Multiple forms of malnutrition were observed, especially in Jharkhand and Madhya Pradesh, which are ranked sixth and fifth among India’s poorest states by per capita income. How are prominent constituencies doing? Prime Minister Narendra Modi’s Varanasi constituency in Uttar Pradesh fares worse on malnutrition indicators than the constituencies of many of his ministers from North India. For children under five, Varanasi has a stunting prevalence of 43.1%, higher than the national average of 35.9%, and ranking 124 from the bottom. While these indicators do not directly reflect the performance of MPs elected in 2014, since they are based on the latest national family health survey which was conducted in 2015-’16, and nutrition indicators take years to change, they do reveal the nutrition status of the constituency. Karnataka’s Gulbarga, represented by Leader of the Opposition Mallikarjun Kharge of the congress party, fared the worst among 18 high-profile constituencies analysed by IndiaSpend based on the Harvard study with one in every two children being stunted. 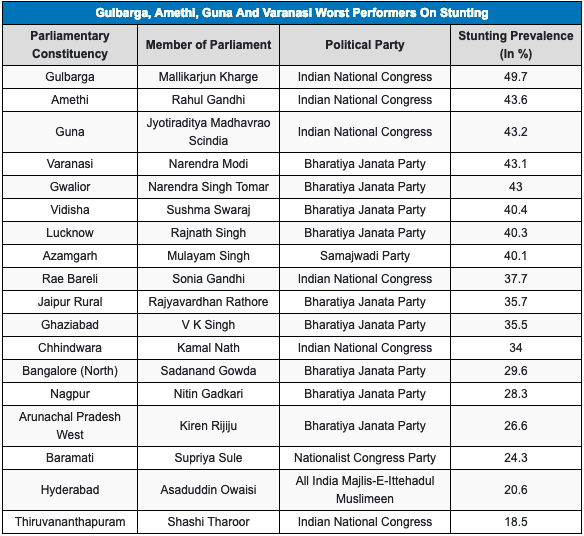 Congress chief Rahul Gandhi’s Amethi constituency in Uttar Pradesh and his party colleague Jyotiraditya Scindia’s Guna in Madhya Pradesh ranked second and third from the bottom by stunting, after Gulbarga among those we compared. Thiruvananthapuram in Kerala, the constituency of the Congress’s Shashi Tharoor, and Telangana’s Hyderabad constituency of All India Majlis-E-Ittehadul Muslimeen’s Asaduddin Owaisi, are the best performers by stunting among the 18 high-profile constituencies we compared. Tharoor has been elected from Thiruvananthapuram since 2009 and Owaisi from Hyderabad since 2004. IndiaSpend used the findings of the Harvard study and added data on MPs for each constituency and visualised them on maps below. 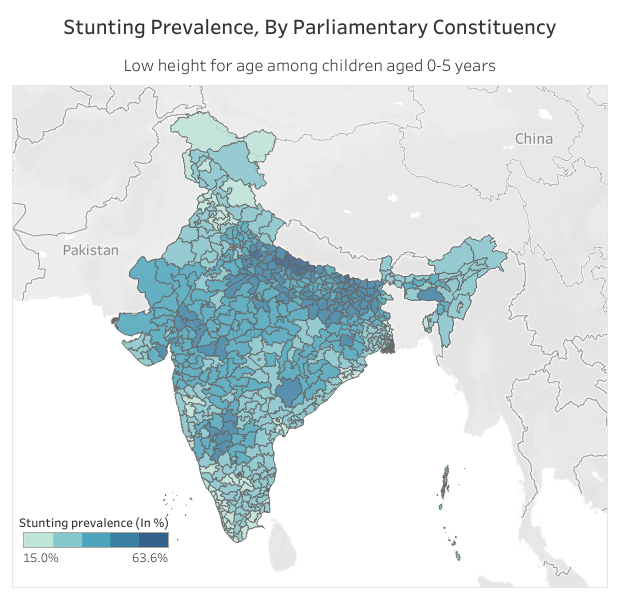 Stunting: Parliamentary constituencies in central and northern India – especially in Uttar Pradesh, Bihar, Madhya Pradesh and Jharkhand, together home to around 400 million or 31% of Indians – have the highest proportion of stunted children under five. Constituencies with the highest proportion of stunted children are all in Uttar Pradesh – Bahraich (63.6%) of Sadhvi Savitri Bai Phule who quit the BJP to join the Congress in March 2019, Shrawasti (61.3%) of BJP’s Daddan Mishra, and Kaisarganj (59.7%) of BJP’s Brijbhushan Sharan Singh. Parliamentary constituencies in Punjab, Himachal Pradesh, Telangana, Tamil Nadu and Kerala have the lowest burdens of stunting. Kerala, in fact, accounts for the top three best-performing constituencies – Kollam (15%) of the Revolutionary Socialist Party’s NK Premachandran, Alappuzha and Mavelikkara (both 15.4%) of the Congress’s KC Venugopal and Suresh Kodikunnil, respectively. Source: State of Nutrition Among Children. Note: Shapefile for the map sourced from DataMeet, based on Election Commission of India data. List of Lok Sabha members and their political parties has been extracted from the Lok Sabha website on March 20, 2019. Underweight: Prevalence of low weight for age follows the same trend as stunting. Parliamentary constituencies with the highest proportion of underweight children are Singhbhum in Jharkhand (60.9%) of the BJP’s Laxman Giluwa, Purulia in West Bengal (54.1%) of the All India Trinamool Congress’ Mriganka Mahato, and Budaun in Uttar Pradesh (52.7%) of the Samajwadi Party’s Dharmendra Yadav. The constituencies of Anantnag in Jammu and Kashmir (11.1%) of former the Peoples Democratic Party’s Mehbooba Mufti, Kottayam (12.3%) of the Kerala Congress’s Jose K Mani (who has since been nominated to the Rajya Sabha), and Inner Manipur (12.5%) of the Congress’s Thokchom Meinya have the lowest proportion of underweight children. 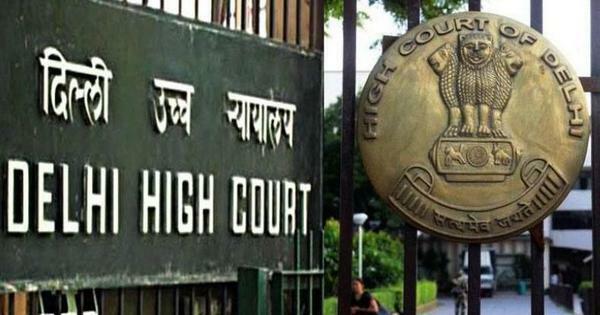 Himachal Pradesh, Punjab, Andhra Pradesh, Sikkim, West Bengal, Assam, Arunachal Pradesh, Nagaland, Manipur, Mizoram and Tripura have the lowest proportion of wasted children, while Inner Manipur (5.9%) of the Congress’s Thokchom Meinya, Outer Manipur (6.8%) of the Congress’s Thangso Baite, and Mizoram (7.3%) of the Congress’s CL Raula have the lowest prevalence of wasting. 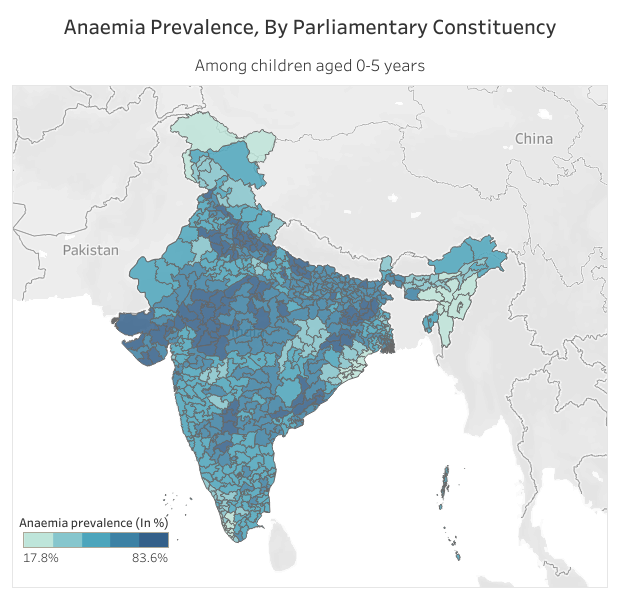 Tamil Nadu, Kerala, Maharashtra, Punjab, Chhattisgarh, Sikkim, West Bengal, Assam, Arunachal Pradesh, Nagaland, Manipur, Mizoram and Tripura have the lowest prevalence of anaemia. Kollam (17.8%) of Revolutionary Socialist Party’s NK Premachandran, Nagaland (20%) of National Democratic Progressive Party’s Tokheho Yepthomi, and Bhubaneswar (20%) of the Biju Janata Dal’s Prasanna Kumar Patasani have the lowest prevalence. In 1993, the government began the MP local area development scheme, or MPLADS, which gives each MP Rs 5 crore for development projects in their constituency. Over 26 years to 2016, MPs have received Rs 31,833 crore in all. Among the uses for MPLADs money for health purposes have been purchase of equipment for hospitals, ambulances, hearses, outdoor gyms, as per the Harvard study. “For example, how health and the Integrated Child Development Services services, school enrolment and quality of services work in their constituency, these are more actionable in the time frames that MPs and MLAs are in power and they likely have more instruments available to change some of these,” said Menon. This article first appeared on IndiaSpend, a data-driven, public-interest journalism non-profit.